I’ve got the Asian comfort-food classic combines with my silky favourite, making this new take-on our healthy and delicious dinner meal. It’s fast and hassle-free, whenever you can find just a 15-minute time. What’s more? This healthy steamed minced pork with silken tofu is suitable for the whole family, especially children and old folks. 1) Mix minced pork, tofu and eggs in a large stainless steel plate. Add seasoning and Chinese parsley. 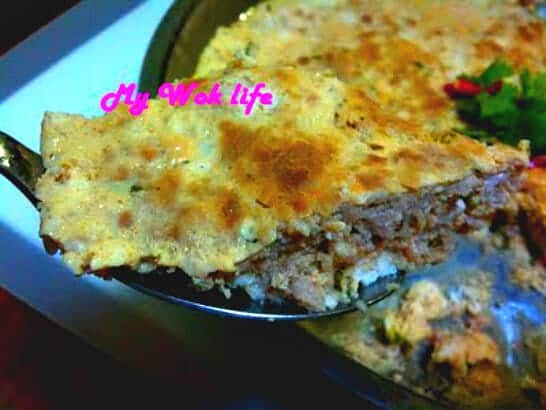 2) Combine all ingredients well with a fork, and then, use the back of the fork to even out the surface of the minced pork mixture. Season the mixture for at least 15 minutes. 3) Place the minced pork dish in an electrical steamer, or on a wire steamer rack in a wok which half filled with water, and steam on high heat, for 15 minutes. Served. A serving of my steamed tofu minced pork dish counts about 170kcal. Tips: Prepare the dish a night before. Store in the refrigerator and bring it out to mix with the eggs only when you are ready to cook it the next evening.